(Fall/Winter 2001; updated 4/2006) - A Lightfoot concert taped in April, 2000 at the Pioneer Theater in Reno, NV, is the only live Lightfoot concert video ever released. It was originally released on both DVD and tape. Portions of the concert were televised by CBC in Canada (an 11 song version) and by many PBS stations in the U.S. (a 14 song version), and PBS offered the video as a pledge gift before it was available in stores. The DVDs and the U.S. version of the tape contain 22 songs - 8 more than were on the PBS broadcasts and almost the entire concert. The PAL tape has only 14 songs (see below for details). The US versions of the DVD and tape are in standard US format (Region 1 DVD; NTSC video). The European version of the videotape is in PAL format and has only 14 songs, the same as on the PBS broadcasts. The European DVD is in Region 0 format. Note on "Region 0": Region 0 means "region free"; Region 1 is North America. Region 0 DVDs will play on software DVD players on PCs. Most newer DVD Players support Region 0, but older and cheaper ones do not. This is Lightfoot's first concert video, and is in fact his first officially released live recording since 1969. Recorded at the Pioneer Theater in Reno, Nevada on April 19, 2000, the video captures the warmth and intimacy of a Lightfoot concert, brought into your home for the first time. The DVD contains 22 songs, almost the entire concert. Lightfoot performs all of his hits - songs that charted in the top 40 for him - as well as songs he wrote that were hits for others. And he includes some of his other great songs which, though never chart hits, are among the best songs ever written. None of the hits are omitted, so you will hear If You Could Read My Mind, Sundown, Carefree Highway and Wreck Of The Edmund Fitzgerald, among others. The other songs come from throughout his career, dating back to the early/mid 60s with Early Mornin' Rain and For Lovin' Me, to the title song from his 1999 original album, A Painter Passing Through. Lightfoot is backed up by his band all of whom has been with him for at least 20 years, and the first two for 30 or more. They are: Terry Clements (lead guitar), Rick Haynes (bass), Barry Keane (drums and percussion) and Mike Heffernan (keyboards), and they are among the finest musicians around. The fact that they have recorded and toured with Lightfoot for so many years says volumes about them and about Lightfoot. The full set list is: Don Quixote, I'll Prove My Love, House You Live In, Sundown, Carefree Highway, Restless, Blackberry Wine, For Lovin' Me/Did She Mention My Name (Medley), Wreck Of The Edmund Fitzgerald, Waiting For You, Fading Away, Rainy Day People, Shadows, If You Could Read My Mind, A Painter Passing Through, Make Way For The Lady, Early Mornin' Rain, Baby Step Back, Song For A Winter's Night, Canadian Railroad Trilogy, Old Dan's Records, Cold On The Shoulder. Amazing list of songs, isn't it? Note: Links at this site are for the DVD from Linus Entertainment, which I stock and sell directly. 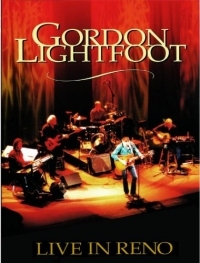 It's the same video as the original "Live In Reno" DVD, and the one from Alpha Centauri Entertainment called "Gordon Lightfut Live", so don't buy this one if you have one of the others.